YellowAirplane.com: TBD-1 Devastator World War 2 Model Kits, Fighter Plane Kits. TBD-1 Devastator World War 2 Model Kits, Fighter Plane Kits. TBD-1 Devastator Model Kits section. 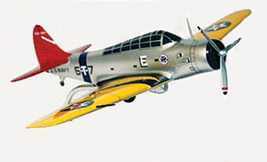 Collectable Model Kits, World War 2 TBD-1 Devastator Model Plane Kits, Huge Kids Hobby Shop. Aircraft Model Kits of the TBD Devastator World War 2 fighter aircraft. A replica of TBD 6-T-4 - which became, in late 1944, the last Devastator in U.S. Navy service - as it appeared when flying with Torpedo Squadron Six off the USS Enterprise (CV-6) in early 1942, this 1/72 scale, die cast SkyMax model features corrugated wing surfaces; a detailed cockpit and a gunner station with a removable, glazed greenhouse canopy; a realistic Pratt & Whitney Twin Wasp radial engine front with a rotating propeller; a pitot tube, a gun sight, an arresting hook, and other fine details; a fuselage-mounted torpedo; optional-position landing gear; and authentic VT-6 markings. 8" wingspan; arrives ready to display on the included stand. a TBD torpedo bomber flown by the U.S. Navy's Torpedo Squadron Six off the USS Enterprise (CV-6) during the February 24, 1942, Wake Island raid (it was later lost during the Battle of Midway), this 1/72 scale, die cast SkyMax model features corrugated wing surfaces; a detailed cockpit and a gunner station with a removable, glazed greenhouse canopy; a realistic Pratt & Whitney Twin Wasp radial engine front with a rotating propeller; a pitot tube, a gun sight, an arresting hook, and other fine details; optional-position landing gear; and authentic VT-6 markings. 8" wingspan; includes a display stand. the TBD torpedo bomber (one of the first TBDs produced) flown off the USS Lexington (CV-2) in early 1938 by Lt. Cdr. William Sinton when he was commander of Torpedo Squadron Two, this 1/72 scale, die cast SkyMax model features textured wing surfaces; a detailed cockpit and a gunner station with a removable, glazed greenhouse canopy; a realistic Pratt & Whitney Twin Wasp radial engine front with a rotating propeller; a pitot tube, a gun sight, an arresting hook, and other fine details; optional-position landing gear; and authentic markings, including VT-2's "bomb man" emblem (a cannonball astride a torpedo) on the fuselage. 8" wingspan; includes a display stand. a TBD-1 Devastator - the first monoplane to be used on a U.S. Navy carrier - employed in the Battle of Midway, this 1/72 scale plastic kit features textured surfaces; a well equipped cockpit and rear gunner station with a glazed canopy; a detailed two-row radial engine; optional-position wings; a torpedo; realistic landing gear; a choice of markings, including those of Torpedo Squadron Eight and Torpedo Squadron Five; and more. 8" wingspan; 72 parts, skill level 2. Weeks before Midway, on May 7, 1942, during the Battle of the Coral Sea, a Douglas TBD Devastator sank the Shoho - the first Japanese carrier sunk during the War. the Shoho as she appeared on that day, this 1/700 scale, plastic waterline kit features the original's complex hull and a realistic flight deck, a fleet of A6M "Zero" fighters and D3A1 "Val" dive bombers, a full complement of guns and lifeboats, authentic markings, and more. 11" long; 200+ parts, assembly required. Made of Philippine mahogany, this 1/32 scale model measures 13½" in length with a wingspan of 18¾". Hand painted and detailed, model is ready to display on the included mahogany base. Doyle. Designed by Grumman as a replacement for the Douglas Devastator, the Avenger went into production prior to the Japanese attack on Pearly Harbor and remained in service until 1954. Here, you'll see the large and rugged plane not only in its well-known role as a torpedo bomber but also in action dropping conventional bombs, mines, and depth charges. 80 pages, 182 B&W and 29 color photographs, 5 color profiles, detailed line drawings, and more. 11"x 8", hardcover. Doyle. Designed by Grumman as a replacement for the Douglas Devastator, the Avenger went into production prior to the Japanese attack on Pearly Harbor and remained in service until 1954. Here, you'll see the large and rugged plane not only in its well-known role as a torpedo bomber but also in action dropping conventional bombs, mines, and depth charges. 80 pages, 182 B&W and 29 color photographs, 5 color profiles, detailed line drawings, and more. 11"x 8", softcover. Originally published by Douglas and the U.S. Navy, this flight operating handbook - previously classified as "Restricted" - taught pilots everything they needed to know before entering the cockpit of the TBD-1 Devastator torpedo bomber, which, introduced in 1937, was the U.S. Navy's first all-metal aircraft. 120 reformatted pages, B&W photographs and illustrations, 8"x 11", softcover. Ginter. Jam-packed with photographs, this is the full history of the Douglas Devastator, from the XTBD-1 prototype of 1935 to the Battle of Midway in 1942, where they were decimated and removed from service. In-between, you'll see the plane's development, systems, construction, and pre-war operations, with a two-page cutaway illustrating more than 150 parts. 96 pages, 210 B&W photographs, line drawings, 8"x 11", softcover. Ernie Boyette. Signed by George Gay, the sole survivor of VT-8's heroic Devastator attack during the Battle of Midway, this limited edition print features a wonderful color profile of Gay's TBD Devastator and documents his wartime exploits. Measures 24"x 18" and is also signed by the artist. Gil Cohen. It's June 1942, and the Douglas TBD Devastator torpedo bombers of Torpedo Squadron Eight are poised to take off from the USS Hornet, ready to attack the entire might of the Japanese fleet off Midway Island. Flying low and slow, all fifteen torpedo bombers were shot out of the sky that day, with Ensign George Gay the only survivor. 35"x 20" limited edition, numbered print is signed by the artist and by Bill Tunstill, Petty Officer 2nd Class in charge of Devastator maintenance aboard the Hornet. Aldock. This book traces the development and service of the TBD from 1937, when it was the most modern aircraft in either the Navy or Army Air Corps, through its time as a sea-based patrol aircraft to its modifications and combat experience during World War II, highlighting the Battle of the Coral Sea and Midway. 49 pages, 100 B&W photographs, 10 color profiles, 3-views and more. 11"x 8", softcover. Combat Aircraft Vol. 20 Barrett Tillman. Noteworthy for being the first monoplane ordered by the U.S. Navy for carrier operations, the TBD Devastator was designed to fulfill a requirement for a new torpedo bomber. Introduced in 1937, it was obsolete by 1942 yet was thrown into the fray at Coral Sea and at Midway. Book covers pre-war service and its contribution to the war in the Pacific. 96 pgs., 85 photos, 28 color profiles, 3-views, cutaways and more. 7¼"x 9¾", sfbd. Lawson & Tillman. With their stout airframes, innovative airbrakes and near-vertical dive capabilities, U.S. Navy torpedo and dive-bombers played a key role in Allied victory in the Pacific. Covers the Dauntless, Helldiver, Devastator and Avenger through remarkable period color photography and first-person accounts from those who flew against the Japanese vessels. 128 pgs., 200 color and B&W photos, 8¼"x 10½", sfbd. 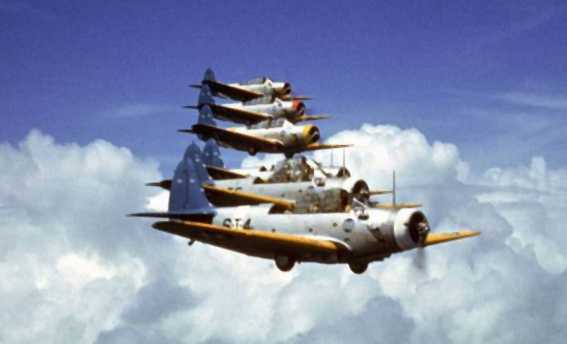 Squadron of Douglas TBD torpedo bombers in flight during the US Navy’s Pacific fleet maneuvers.